There’s a black and white sign that hangs on a door inside the Stube Agency, a business that’s been a fixture in the Almonesson section of Deptford for the last half century. It’s the kind of sign you’d find among humorous nick-nacks in a variety shop or antique store. Everyone brings joy to this office, some when they enter, and others when they leave. And some spread joy when they’re here and are revered when they walk out the door for a final time, like the Deptford man who spent countless hours inside this home office space and at the building just up the road, too, at the Almonesson Lake Fire Department. Harry T. Strube, Sr., a lifelong Deptford Township resident and a fireman for nearly seven decades, passed away on Jan. 23. Strube was 83 years old. Strube, a devoted husband to Pat Strube for 53 years, father to Harry T. Strube Jr., and Tara Tomlinson, and “PopPop” of seven grandchildren, had given a remarkable 68 years of service to the Almonesson Lake Fire Department, serving in just about every role that was available within the company from the 1950s through the 2010s. “It’s easily going to take five people to fill that guy’s shoes,” said Michael White, the chairman of the Deptford Township Board of Fire Commissioners. 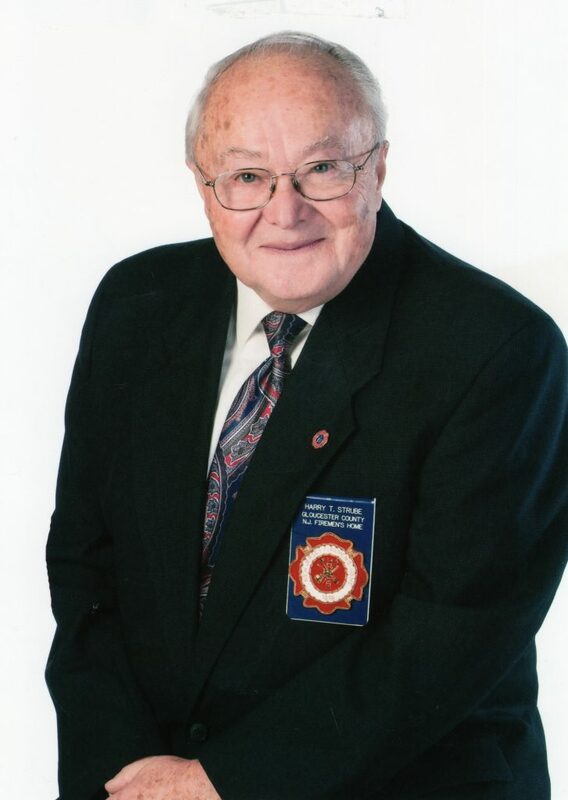 “He was the secretary for the township Relief Association for 50 years, he was a member of the Almonesson Lake Fire Company for over 60 years, president of Almonesson Lake Fire Company for over 40 years. On Wednesday, Jan. 30, family members, friends, and people representing fire departments from around the state came to respectfully celebrate a life well lived when Strube was laid to rest. Two fire trucks were parked at Hillcrest Memorial Park and Cemetery during the funeral proceedings, one with an American flag hanging from atop the extended ladder. An honor guard stood at the casket, fellow firemen stood as pallbearers, and bagpipes provided the soundtrack on a somber winter afternoon. During his final weeks, Strube had to be convinced by his son, Harry Strube Jr., to give the go-ahead for the final services. Harry Strube Sr. owned and operated the Strube Agency since 1973. He was also a member of the Gloucester County Board of Realtors, a founding member of the Deptford Business Association, a former member of the Deptford Township Zoning Board, a past president and member or the Deptford Kiwanis Club, and a member of both the Mantua Lodge No. 95 F&AM and the Shriners. But it was probably his decades of service and dedication to the community as a volunteer firefighter and as an advocate for his fellow firemen in numerous roles throughout his career that defined Strube’s legacy. “I think most importantly … he’ll be known for his dedication to the Relief Association, which is an insurance that takes care of volunteer firemen in their time of death, to make sure (their families) are properly taken care of,” Deptford Township Councilman Ken Barnshaw said at the most recent council meeting. As a longtime executive secretary and Gloucester County manager of the New Jersey’s Firemen Home (formed in 1898, it’s the only licensed health-care facility in the state with a primary mission dedicated to New Jersey firemen and women), Strube continued to make the weekly, two-plus hour trek to Boonton to fulfill his duties and represent his fellow firemen. He was still making the nearly five-hour round trip up until the month before he passed away. And now the best that White, Strube Jr., and the rest of the men and women within Deptford Township’s tightly-knit fire community can do is take the lessons they learned from “The Grandfathers” and honor them with their own service and selflessness.